When I last left you, I was a bit in denial about my upcoming 70.3. Since my training for this race wasn't exactly up to par, I had decided to "just have fun" instead of actually racing. You know, not worry about my time, don't stress about weather or anything like that - just have fun and possibly even be social along the way. I always hear about people making friends during races, maybe I could do that, too! Ah, wishful thinking because you know what? You can't turn a 70.3 into a "fun run." Can't be done. The race is just too long and no matter how slow you go, you're still going to suffer. And suffer I did. It started almost immediately when I got in the water. My heart rate just skyrocketed. I didn't "think" I was nervous, however, something weird was going on. Part of my issue might have been that I was one of the first people in the water (thanks to some of my FTP team mates and a rolling self-seeding start) and I was getting passed like I was treading water out there. Not only was my HR going crazy, but I was also having trouble breathing, which is a REALLY bad thing when you're trying to swim. Normally, I'm a 3-5 stroke breather, but during this race, I was breathing every stroke. I was so focused on my breathing that I stopped sighting...which was stupid because I not only ran into one giant yellow buoy, but two. It was fantastic. I was a mess out there. 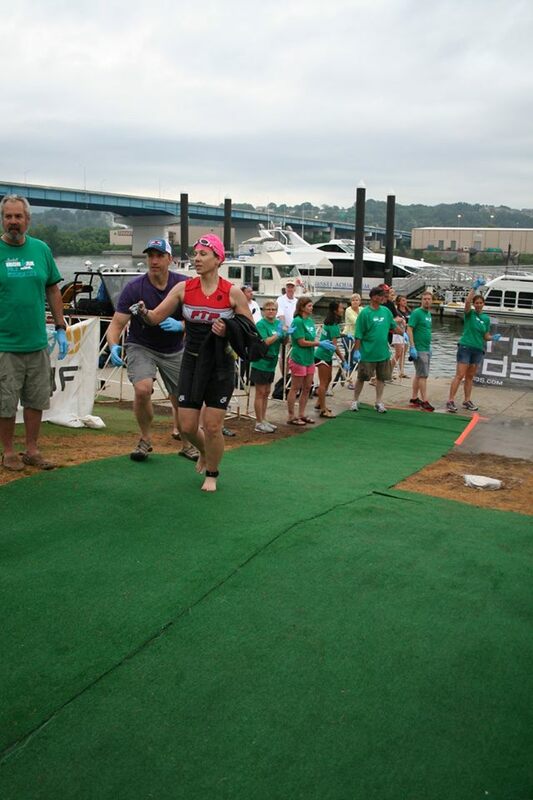 I was hoping I'd eventually find my way, but unfortunately, I never really got into a groove with this swim. It just drained me. My breathing issues caused me to tense up, which used extra energy. My arms were burning during the swim because they were so tired, and they had no reason to be. It's not like I couldn't do the distance - I swam longer during training every week. But I was just exhausted. While I never held onto a kayak or canoe, I really wanted to. I was that tired. Anyway, after what seemed like forever, I finally heard the cheers for the swim exit. HAZZAH! A nice volunteer pulled me out of the water and sent me over to the wetsuit strippers. Normally, in a race, I'd run over to them as fast as I could, undoing my wetsuit as much as possible prior to reaching them. Transition times count! However, I was so tired coming out of the water, that I just walked over to the strippers and had them remove the whole thing. And then I walked up the hill into transition. I KNEW I should have been running, but I just didn't have the energy. The racer ahead of me dropped his goggles. Somehow, I had the energy to pick them up. I was about to chase the athlete down, but the guy in the purple shirt did it for me. Me noticing Kelly. Hi Kelly!! I figured I'd regain some of my strength during the bike. Cycling is second-nature to me, surely my experience with this would be better than my swim, right? Long story short - NOPE! My lethargy from my swim never left. EVERYTHING was a struggle. 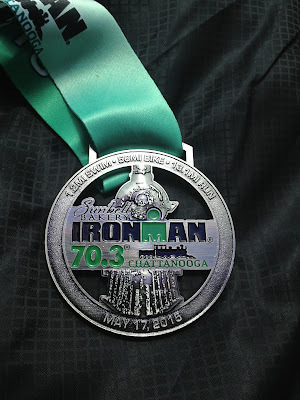 Most of this course was the same as Ironman Chattanooga, and I could compare how I felt during parts of that race with how I was currently feeling. It was completely different. Back in September, I felt smooth. The bike ride almost seemed easy. Unfortunately, this ride was anything but easy. For one thing, it was raining and did so on and off throughout my ride. Not crazy raining, but raining none the less. The forecast had called for this, and I had swapped out my race wheels for my training wheels. (My race wheels are carbon fiber and they don't stop well in rain.) This had a little bit to do with my ride being harder, but I don't think it effected me too much. I did ride a bit slower though, just because of the rain. Yes, I'm a wuss. Or as the guy at the bike shop who sold us new brake pads for my training wheels said, "Oh, you're racing for safety." Exactly. If I were fully trained and feeling good, I'd take a few risks. But I wasn't, so why tempt fate? I also had some mechanical issues with my gears. When I switched to an easier gear to climb a hill, my bike started making a grinding noise and my gears started slipping. I'm not sure why this happened, as I tested my bike after swapping out the wheels with no issues. But during the race, it sounded (and felt) like my chain was going to be eaten by my rear cassette. As a result - I didn't switch gears and had to use my harder gears to climb hills. Not a whole lot of fun. By the time I hit the transition area again, my legs were fried. Under normal circumstances, a ride like this would have really made me upset. I was about 20 minutes slower than I should have been for a ride of this distance. But I was tired and beyond the point of caring, so it didn't bother me too much. I FELT like I should care, but I didn't. I just wanted the race to be over. Alas, it wasn't. I still had a half-marathon to run. Throughout my training, my running has been the only thing that's been relatively consistent, and I've had two sub-2:00 half marathons to show for it. Not that I was planning on running that during a 70.3, but I had a small hope that I might be able to have a respectable run. That small hope was dashed coming out of transition. Yes, I knew THAT quickly that my run was going to be a sufferfest. My entire body hurt, especially my legs, and any mental toughness I had was long gone. And this was at the very beginning of my run! I basically did anything I could to just keep moving forward over the next 13.1 hilly miles. It was really ugly and painful, but I did it. I'm literally telling Kelly "I'm dying" in this photo. And I was. With Kathy and Kate, who finished WAY before me. I'm torn about how I feel about this race. I knew going into it that it wouldn't be my best race and that hurt me. 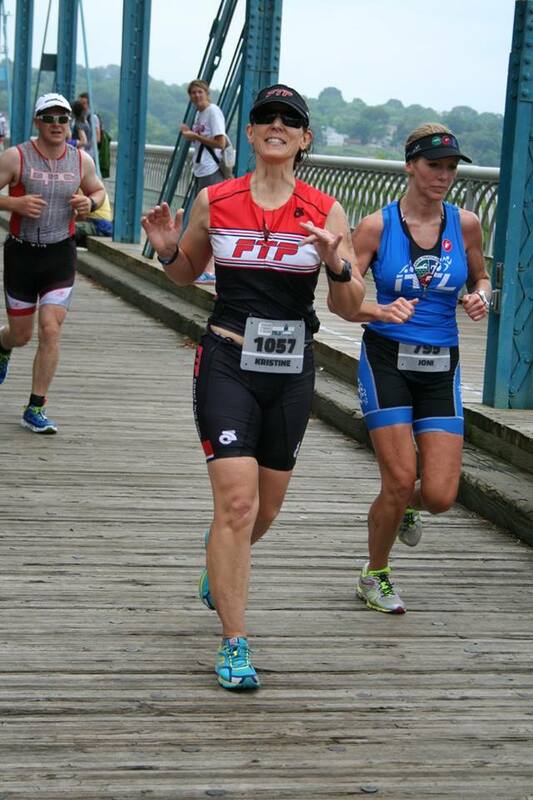 Triathlons are mentally taxing and if you don't have the right mindset going in, your race can be a disaster. And while my race wasn't exactly a disaster, it was a lot worse than I thought it was going to be. I think I was more fit than my results show, but I wasn't mentally strong enough to race harder. All in all though, I'm glad I went through with the race. 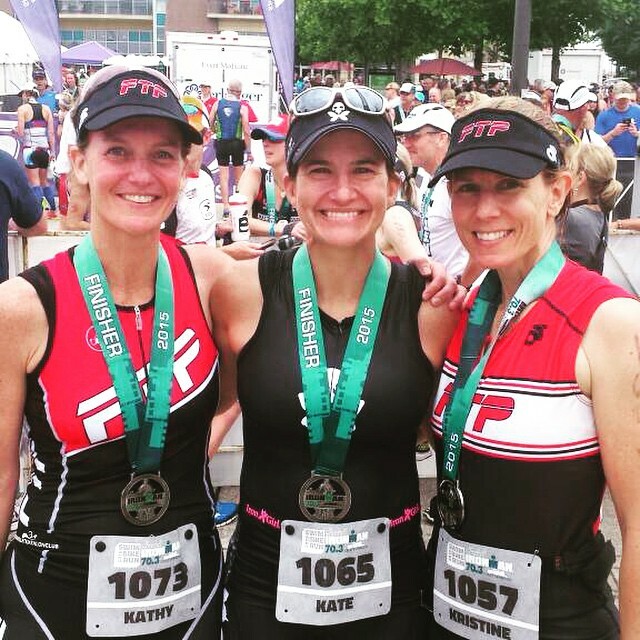 Ironman puts on a great race with a lot of surrounding hoopla. That's fun. (Though it would have been nice if they changed the color scheme from IMCHOO. A lot of the race swag was the same or very similar - it just said 70.3 on it.) Additionally, Chattanooga is a fantastic host city. We always have fun in Chattanooga. It was also good to see so many of my tri friends after a long Winter of training solo. However, the absolute best part of the weekend was that the hotel Dudley and I stayed in happened to be the host hotel of the Cardigan Welsh Corgi National Championships and Cardis were EVERYWHERE. 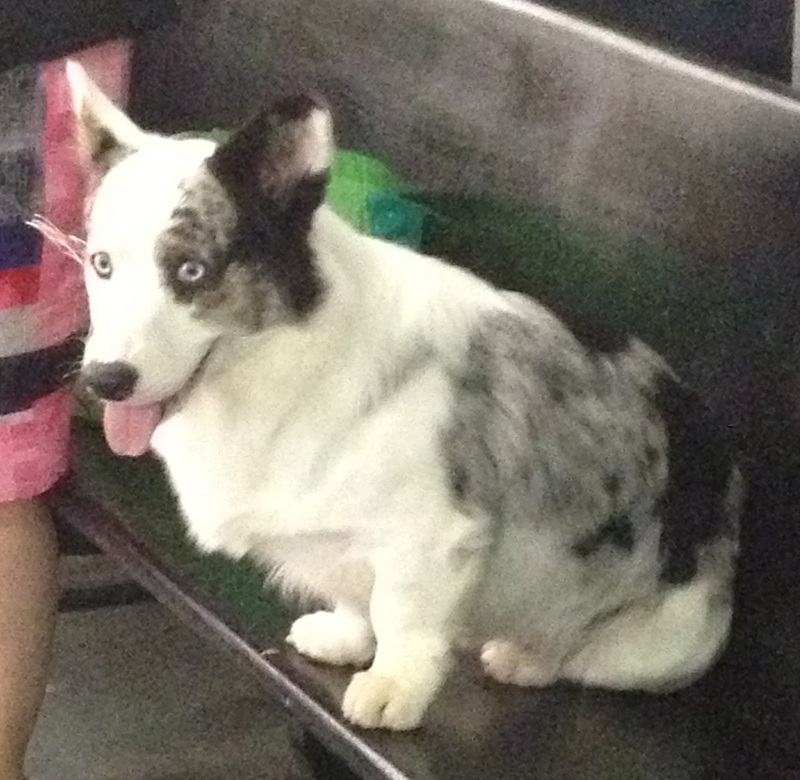 We have two Corgis, so this was pretty much heaven for us. 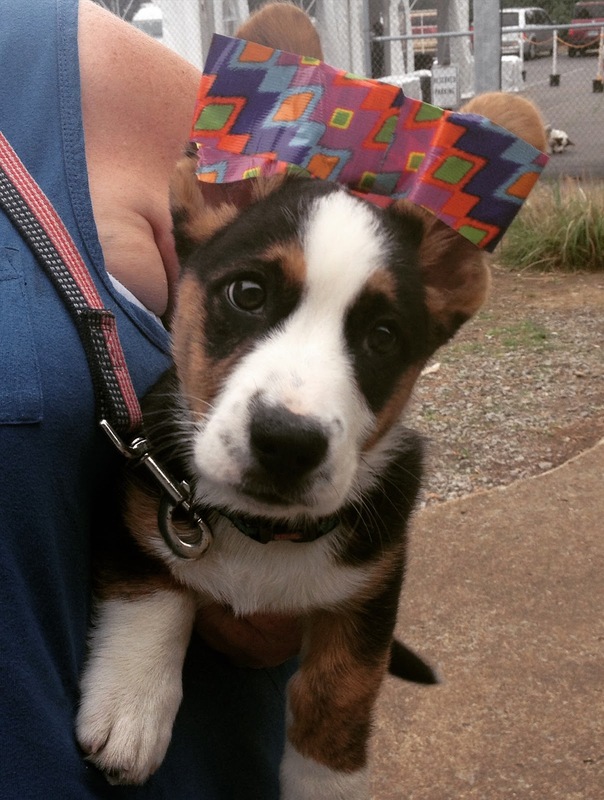 How can you have a bad weekend when you're surrounded by this cuteness? So yes, I'm glad I went. A huge thanks, as always, to Dudley for his support. 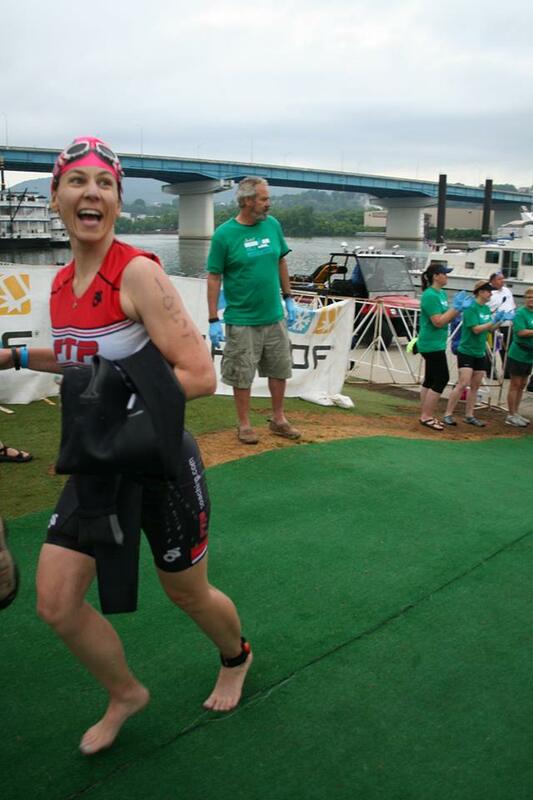 Being the spouse of a triathlete isn't easy, especially when they're not having a good race. Of course, I also need to thank the team from FTP Coaching. The fact that I could even finish this race with the Spring I had is a testament to how good Andrew and Jessica are. Thanks also to the many friends and team mates I saw out on the course, both racing and not racing. I loved seeing so many smiling faces out there. The good news that this past weekend was my best training weekend in a long time, so whatever ennui I was experiencing over the last month seems to have abated. Not that I have any 70.3s on the horizon. I do have Mach Tenn triathlon coming up this weekend though. We'll see how it goes! 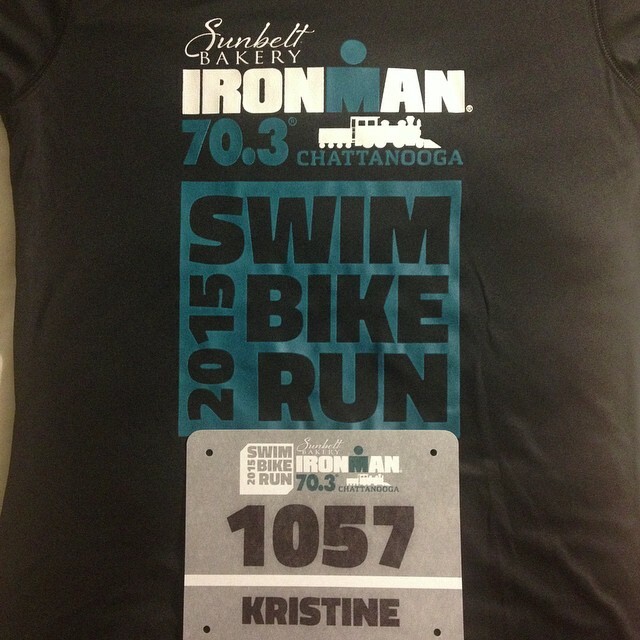 Apparently, I'm racing Chattanooga 70.3 this Sunday. Sorry, I have to repeat that because I'm too busy laughing to actually comprehend what I just wrote. I'm racing Chattanooga 70.3 this Sunday. THIS Sunday. I'm so deep down into denial that I just can't believe it. It wasn't always like this. No, months ago when this race was first announced, I was all "YEAH! This is GREAT! I'm going to CRUSH this thing!" I was really excited and it was going to be my A triathlon of the season. Many of my friends were doing it, plus, I was still riding on my post-Ironman rush and I felt like anything was possible. Silly, silly me. Today, I can not complete my _____________ workout because _____________. Hopefully, I'll get back on track next week." With every event, I thought "I'm OK. I have time to make up this training." But every week brought new challenges and little-by-little my focus on this race diminished. (Well, I say little-by-little, but honestly, when you get a call saying that one of your parents is in the hospital, you don't really care about training anymore AT ALL.) And now, I'm officially out of time. The race is this weekend. Chattanooga 70.3 has morphed from my A race to a "just do anything you can to get through this thing." I seriously contemplated dropping out several times, most recently two weeks ago. The stress of this past Spring has just left me exhausted and, honestly, not caring about the race. Which is a hard thing to admit because I really wanted to do well, at first. I have a competitive personality and it's difficult to go into something when you know you're not prepared mentally or physically. 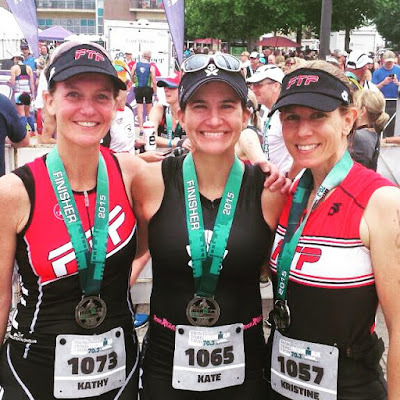 Pretty much the only reason I didn't drop out is because one of my FTP teammates, Jan, broke her arm recently and I realized how lucky I am just to be able to race. Sure, I'm not as fit or fast as I could be, but I'm healthy and I should be grateful about that. So, I will be in Chattanooga on Sunday. Here is my race plan - I'm not going to worry about my time - I'm just going to have fun. Well, as much fun as you can have while traveling 70.3 miles under your own power. But, I'm not going to obsess about the course, or the weather or the other minutia that triathletes stress about before a race. I'm going to go and soak up all of the awesomeness that surrounds a triathlon, especially a big one like this one will be. I'm going to buy a few pieces of overpriced race swag and not feel guilty about it. And most importantly, I'm just going to take the race mile-by-mile and finish smiling. Which, really, is all I should ever want out of any race. I'll let you know how it goes.